Gonzaga’s in the Sweet Sixteen. And Vivian Frieson carried them there. Kelly Graves, the part-time carnival barker, part-time coaching whiz in charge of the Gonzaga women’s basketball program, loves to talk. Strap an odometer to the man’s tongue, and you’d reach 100,000 miles in no time. There are times, however, when Graves talks even more than usual. Even more enthusiastically than usual. Even more lovingly than usual. Like, say, when Graves talks about Gonzaga senior Vivian Frieson. “One of the best people with one of the best personalities I’ve ever coached. Love her to death,” Graves was saying a while back, before Frieson’s memorable performance Monday carried the Bulldogs into the NCAA tournament’s Sweet 16 round for the first time in women’s basketball history at Gonzaga. Not to mention great basketball skills. The solid all-around game of Frieson, a 6-foot-1 forward from Seattle, has often been lost in the considerable shadow cast by the school’s all-time leader in points (Heather Bowman) and the school’s all-time leader in assists (Courtney Vandersloot). On Monday, however, when Vandersloot struggled mightily (11 turnovers) and Bowman had a quiet night (six points, three rebounds), Frieson played anywhere and everywhere and did anything and everything necessary to beat ninth-ranked Texas A&M. You need points? Frieson led everyone with 23. You need rebounds? Frieson led Gonzaga with nine. Toss in six assists, four blocked shots, three steals and just two turnovers in 38 minutes — even though Frieson had to bring the ball up the court occasionally in the second half against the cat-quick Aggies when Vandersloot wavered — and you have a game for the ages. Oh, almost forgot. After Vandersloot fouled out late, Frieson calmly stepped up and canned a game-winning 12-foot jumper with 17 seconds left for the final points in a 72-71 victory in Seattle. “She put us on her shoulders and carried us,” Graves said after Gonzaga’s 20th straight win. Count Graves as the last person on earth to be surprised that Frieson (pronounced FRY-sun) would remain focused when mayhem reigned during A&M’s furious second-half rally at Bank of America Arena. Frieson said she prepared herself to take the game-winning shot during a time-out late in the game. Frieson developed a measure of toughness when she spent her final two years of high school living a few miles south of Bank of America Arenain the crime-ridden Central District of Seattle. “There was always a background of sirens,” Frieson recalled. 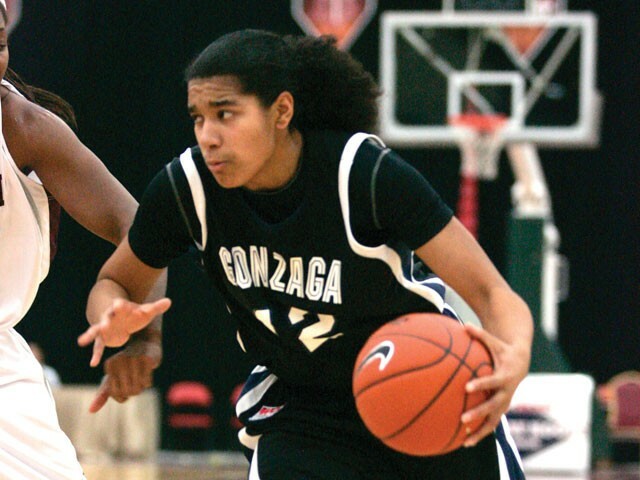 Frieson’s mother, Julien, moved the family across the Puget Sound from Bremerton largely to benefit Vivian’s basketball career by having her play at prep powerhouse Garfield. It was hardly the first sacrifice Julien made for her daughter, since Julien raised Vivian alone after the father began a 16-year prison sentence when Julien was pregnant. Vivian, whose glowing personality and electric smile provide no hint of past challenges, was in high school when she met her father for the first time. He was in a halfway house in Toledo, Ohio. Frieson was not highly recruited out of Garfield. She blames that on inconsistency and another factor that comes as a shock to those who have observed her energetic play at Gonzaga. “I was just lazy,” Frieson says. Who woulda thunk it? Certainly not longtime Texas A&M coach Gary Blair, who could be seen and heard berating his players at halftime on national television Monday. Indeed she was. Now Frieson and 14th-ranked Gonzaga (29-4) must kick the butts of fifth-ranked Xavier or unranked Vanderbilt (those teams were scheduled to play Tuesday) on Saturday in Sacramento, Calif., to achieve the Bulldogs’ season-long goal of playing in the Elite Eight. One of the ESPN’s networks will carry Saturday’s came along with KGA 1510 or KEYF 1050 radio in Spokane. Tipoff had had yet to be determined at press time.